I woke up around 5:30 am and got all ready for the race. We left our house around 6:15 am to get to the start line at Dodger Stadium. The drive should have taken 15 minutes at most. However, true to L.A., it took an hour. We sat in bumper-to-bumper traffic forever as there was only one way to get up to the stadium. Once we got there, it was more chaos, the guards screamed at all the cars not letting anyone get dropped off by the start line. In anticipation for running 26.2 miles, I knew that I didn’t want to walk any extra distance so I completely ignored them and got out of the car anyways. And we did…as we crossed the finish line, we held hands and I was in tears. I can’t believe what I’ve been able to accomplish all in the honor of the children of GOTB. It has just been amazing. The experience of the marathon was equally as incredible. As we ran yesterday, we saw so many different people participate in marathon. There were at least 4 different Elvis’s, a Marilyn Monroe, someone dressed in a full furry costume, which wasn’t too smart given the 80 degree heat, someone running with a 4 ft. by 3 ft. wooden cross, who decided to forsake Jesus at about mile 14 due to exhaustion and a bunch of people running with American flags and military flags. The most inspiring person I saw was a man about my age that walked with crutches as his legs weren’t strong enough to support his weight. Even though he could barely walk, he was motivated to run a marathon. 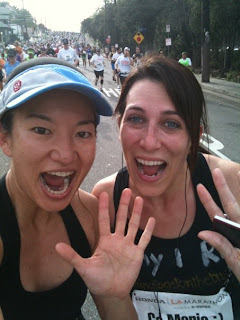 Mile 1- As we crossed the start line, we started our first steep climb around Dodger Stadium. Leanne and I looked at each other and said, “Wow. This is going to be an interesting race.” As we crossed mile 1, I saw my first spectators my assistant Jennifer and her boyfriend Kyle. Mile 2- After seeing traditional Mexican dancers, we headed up to Hill St. in downtown. This street really capitalizes on its namesake. As we got to the top of the crest, we were greeted by an ancient drum line, which was really cool. Mile 3- We turned onto Cesar Chavez and were greeted by Joe and Gigi and a mariachi band. We got so much energy from seeing them. Mile 4- I started to get emotional about how unbelievable that all this training had been worth it and I was in disbelief that the marathon was finally here. Mile 5- We were greeted by this great group of people from the Dream Center. One guy was wearing a Steelers shirt so it was over. I yelled, “here we go Steelers, here we go.” The guy started chanting back and high fived me as I ran past. Mile 6- We passed by a school for blind children and they were all out front cheering and slapping people high fives. Of course my hand went in the air as I high fived every last kid. Mile 7- We headed into Silverlake and we passed our first injured runner. It was a young girl who seemed to fall and hurt her leg. I felt for her as I know how much sacrifice it takes to train for this one day and to not finish is just devastating. However shortly after, my spirits were uplifted as I saw Joe and Gigi with our friends Derek, Emily, and their dog Holly. Mile 8- Although Leanne and I are good gabbers, we decided to listen to some music. I was extremely happy as both my friend Marylou and my brother-in-law Frank and gotten me gift cards to load up my Zune so I had all new music to rock out to. The first song that shuffled onto my Zune was appropriately, “I Run” by Lady Antebellum. It was a total coincidence but this song really encompasses every aspect of why I run so I teared up. Mile 9- Pete Carroll, Coach of the Seattle Seahawks was in the middle of the runners giving high fives. Of course, I didn’t pass this one up even though I would have rather them had Mike Tomlin there. Mile 10- We saw Gigi and Joe for the second time. Another burst of energy. Mile 11- We headed into familiar territory in downtown Hollywood. As we made the turn onto Orange, a lady asked me about what my shirt meant and she said that I was an inspiration to her. Another burst of energy surged through my body. Mile 12- I saw my neighbors Kelly and Jeff and they were so kind to bring Maya. Maya was obsessed with how the light was reflecting on the sidewalk, but I ran up to her and petted her and she went bananas. She tried to jump into the race to run it with me. It was so cute. Mile 13- We saw Joe and Gigi again and tasked Joe to get us some salt as we were starting to cramp up. We then saw our old neighbors Ian and Shira and their baby Lena and then my friend Davin! I was literally bursting with excitement. Mile 14- As we rounded the corner down San Vicente Blvd, we saw our friend Michael and he was standing next to the West Hollywood mayor. I was feeling great. Mile 15- Going into Boy’s Town was quite a treat. There were half naked gay men dancing on makeshift stages and in the middle of it all was our friend Ed, which is really funny because Ed is as straight as they come. Although I was tempted to jump on one of the stages and give a little shake, I kept on running. Mile 16- As we crossed over to Burton, we were greeted by our friends Bill and Juliet and Juliet’s mom. Joe and Gigi were also there with our salt. We also saw Michael again right by Rodeo Dr. I was still having a great time. Mile 17- This is where the marathon started to take a downward turn for me. We ran through Century City and saw no one and there were hardly any spectators. At this point, my adrenaline was wearing off. Instead of doing a 1 minute walk break and a 5 minute run, we put in an extra minute walk break. Mile 18- Ouch in pain. That’s about all I could remember. Mile 19- Still in pain and I could have swore they spaced out the mile markers as it seemed it was taking forever to get to the next one. Mile 21- This was the crappiest mile on the course. We ran through a veteran’s park and there was no one there. The only redeeming quality was the one crazy vet that just kept screaming people’s names. He was a super cheerer. Mile 22- Joe and Gigi were also here. However the true highlight was the fireman. They set up hoses for everyone to run through. The last time I ran through water was when I was young and we used to run through the sprinklers. Do you realize how awesome in 80 degree heat it feels to do this? I ran through every hose because it was so much fun. Mile 23- Again we saw Tommy, Erin, Joe and Gigi and there was a crazy marathon cheerer guy that came up to me personally and gave me a strategy for the rest of the race. He said it was all flat. Although he was a big liar, it was what I needed to hear right then. I believe at this point I was also crying but not tears of joy, tears of pain. Mile 24- We went back to having only 1 minute walk breaks as we were getting excited to end this thing. Mile 25- This mile marker was hidden around a turn so I kept on thinking we missed it. However as we rounded Ocean Blvd, there it was. Mile 26- Holy crap, I am really going to do this. Mile 26.2- I crossed the finish line!! I want to say a special thank you to everyone. Without you all, I could have never done this. Thank you to everyone who came out to support me yesterday. Thank you especially to our two college friends Ed Norton and Brenda Chroniak for your kind donations. 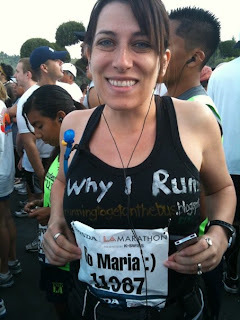 Brenda is running the Boston Marathon next month so my luck goes out to you girlfriend. I will continue to be humbled by this experience for years to come. Lastly, if you would like to view more photos, please check out my facebook page and Joe will also be uploading everything onto our photo website www.joepalmer.shutterfly.com. Thanks Joanne. I need to bring you to the next one so I can get some great photos. Thank you for all of the inspiration. Just 4 days until our race up here in Oakland. Your Blog has kept me energized to train for the Oakland marathon and Coordinate the Northern Region GOTB efforts with Claire. It is a gift to know you! Thank you for your words and example! Thanks Tara. You and Adam are going to rock. I am so proud of you. I am going to track you online. You will do it! !